Wait a minute here. Writing is using words, isn’t it? Yes, but it’s also more than that. Often when I listen to how people evaluate stories, I hear them talk about dialogue. When they talk about the script for a film, they are often talking about the dialogue. Or when they mention how well a book is written, they most often mean the way the words are put together—the beauty of a sentence. When people speak of Shakespeare’s work, they almost always talk about the beauty of the language. These are all forms of visible ink. This term refers to writing that is readily seen by the reader or viewer, who often mistakes these words on the page as the only writing the storyteller is doing. But how events in a story are ordered is also writing. What events should occur in a story to make the tellers point is also writing. Why a character behaves in a particular way is also writing. These are all forms of invisible ink, so called because they are not easily spotted by a reader, viewer, or listener of a story. Invisible ink does, however, have a profound impact on a story. More to the point, it is the story. Invisible ink is the writing below the surface of the words. Most people will never see or notice it, but they will feel it. —Brian McDonald, Invisible Ink, Chapter One. All quoted text is copyright original author. Emphasis mine. 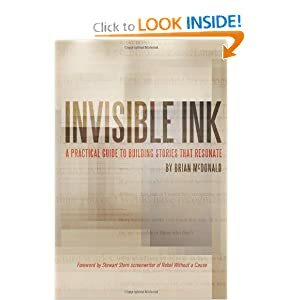 Yesterday I started reading Invisible Ink by Brian McDonald. It was incredibly difficult to put down, and if I hadn’t had house guests that afternoon, I would have finished it in one sitting. Today I finished it. I’ve read A LOT of books on writing. I own a bookcase—not just one or two shelves—filled with books on the subject, and I have read dozens more. Most books repeat what others have said before them. Never have I read a book on storytelling that has so much original content as Invisible Ink. There were several subjects from the book of which I had not heard before, or had not seen explained well until reading the book. Writing is more than just the words on the page. Establish the story’s reality at the beginning. The idea of your story (sometimes referred to as “theme”) is the armature of your story. Jokes can teach you a thing or two about structure and set up. The use of “clones” is a tool that master writers use to show, not tell, their idea. Each character needs to serve a purpose in the story. Comic relief is not a purpose. Have characters experience their own personal hell. It will make them better people. Speak the truth, not the facts. The best stories have “masculine” and “feminine” parts. Physical action and plot (“masculine”) as well as emotional truth (“feminine”). The best stories transcend genre—anyone can enjoy them. Don’t write subplots. Write supporting plots. Think of the audience (Address and Dismiss, Address and Explain, Superior Position), but don’t bring attention to yourself as writer. Once you pay attention to theme, you’ll see what works and what doesn’t in other stories. This is an outstanding book and fast read. Grab a copy and read it. Highlight the head-scratchers. McDonald gives really great examples of his points using movies and books. Think theme isn’t important? Think morals in books are preachy? Check out Invisible Ink, and chances are McDonald will show you why your favorite stories have made such an impression on you. I was lucky enough to take a class with Brian McDonald in Seattle. His book is great and his teaching is great–the most useful concepts for framing story that I’ve ever come across. I’d love to take one of his classes. He’s a righteous dude.